The day began clear and cold. There was about an inch of fresh snow on the ground at the base, which got deeper as we went higher. I think the summit had just under a foot of snow, but both the trail and summit were well-packed. 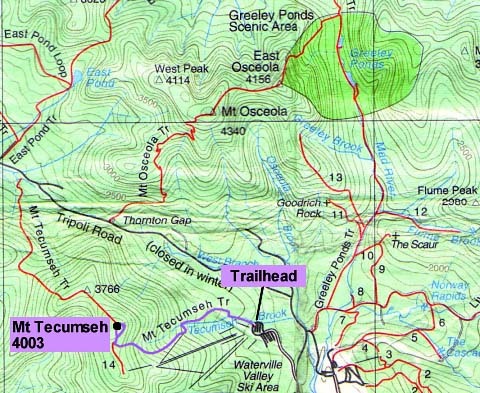 After driving up the morning after the sleepover party for Holly's 13th birthday, I parked the car at the Waterville Valley Ski Area and Erin and I started up the Mt Tecumseh Trail at 10:40 AM. The trail began by crossing the brook, and we continued up the south side of the brook, following the footprints of those before us. There were some, but not many, yellow blazes on trees. After a while, the trail got narrower and narrower, wound through the trees, and we were soon bushwhacking. I soon figured we were going the wrong way, so we turned around and looked again for the yellow blazes. We found a stream crossing that we had missed, crossed it, and continued on the real trail. This mistake cost us about a half hour. We learned later that others had done the same thing. After crossing the brook, the trail climbed a ridge and soon became boulder-covered and rough. Then, it dropped steeply down some steps back to the brook and climbed up the other side. On a side trail leading to a ski trail, we could see the Tripyramids in the east. Soon, we started to hear a bell ringing every few seconds. It sounded like a phone in the woods, but it turned out to be a signal at the bottom of one of the ski area’s upper chairlifts. The upper part of the mountain had snow for skiing, but the lower part wasn’t open yet. The trail soon became wider and continued steadily up the side of the gorge. We stopped to eat lunch around 12:30, then continued on. 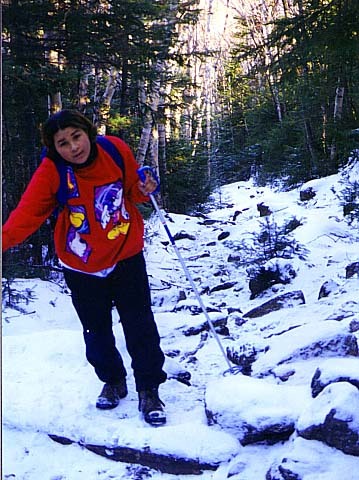 After awhile, the trail got quite a bit steeper and narrower, the snow became deeper, and the spruce trees were coated with snow. 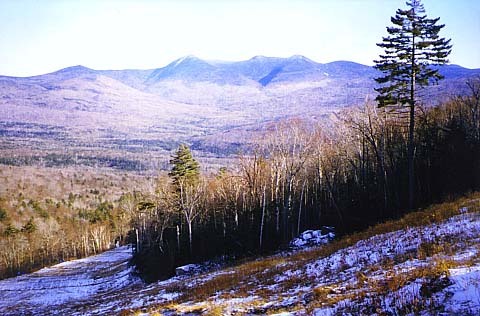 View east from the ski trail. The three peaks in the distance are the Tripyramids: North, South, and Middle. 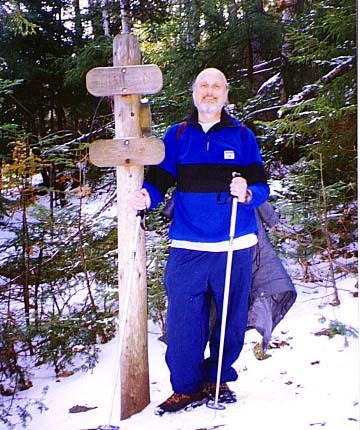 Me standing next to a trail sign on the Mt Tecumseh Trail. The hiking trail comes very close to the ski trail at this point. It was here that we began hearing the bell ringing. Erin struggling up the middle portion of the trail. After turning right at the sign in the previous photo, the trail ascends moderately, and is monotonously straight for some distance along the gorge. 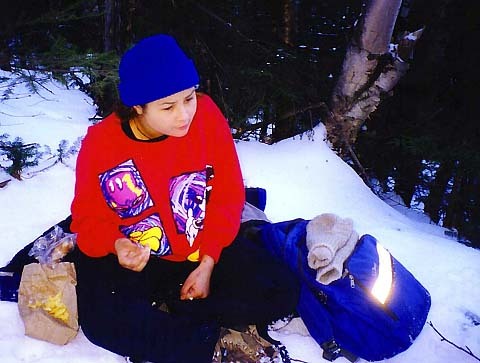 Erin eating lunch on the trail. There were no really great spots to stop and rest, and Erin was tired, so we just ate along the side of the trail.